Antenatal Steroids closer to term? 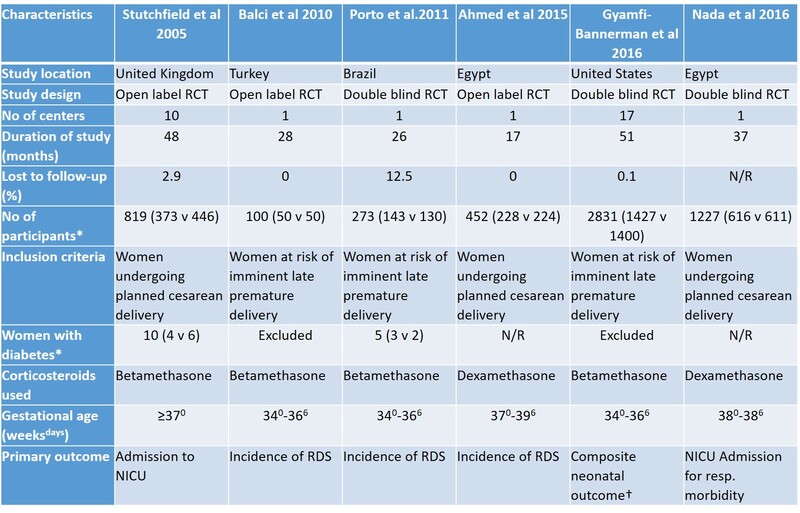 A new systematic review in the BMJ (Saccone G, Berghella V. Antenatal corticosteroids for maturity of term or near term fetuses: systematic review and meta-analysis of randomized controlled trials. BMJ. 2016;355:i5044) includes 3 studies which examined the use of antenatal steroids in mothers at high risk of delivery between 34 and 36 weeks 6 days, and 3 studies of using antenatal steroids prior to elective section after 36 weeks. The results are firstly presented with both categories combined, which I think is very questionable. I can see no clinical value in combining the 2 categories of studies, there is no overlap in the gestational ages, so the combined outcomes are meaningless. No mother could have been eligible for both of the groups of trials, which I just realized is a good criterion for deciding if you should perform meta-analysis of trials. Barrington’s new rule for meta-analysis: If it is impossible to have been eligible for both of 2 trials, don’t combine them. Now I will have to go through my own Cochrane reviews and see if I follow my rule. The reasoning behind the rule should be obvious, the only point of doing a Systematic Review (SR) of an intervention is to be able to answer a clinical question. Such as “if I have a baby at term with hypoxic respiratory failure should I use inhaled nitric oxide, what are the benefits, and what are the risks, compared to no nitric oxide?” So meta-analysing all the studies which randomized babies for whom that definition is accurate is appropriate. The first 3 forest plots in the antenatal steroid SR on the other hand give an answer to a question which will be never be asked, “if I have a mother who is somewhere between 34 and 40 weeks gestation and might be high risk of delivering before 37 weeks or on the other hand might be planned for an elective caesarean delivery after 37 weeks, should I give her steroids at some point, either now or….” (I gave up trying to formulate the question). 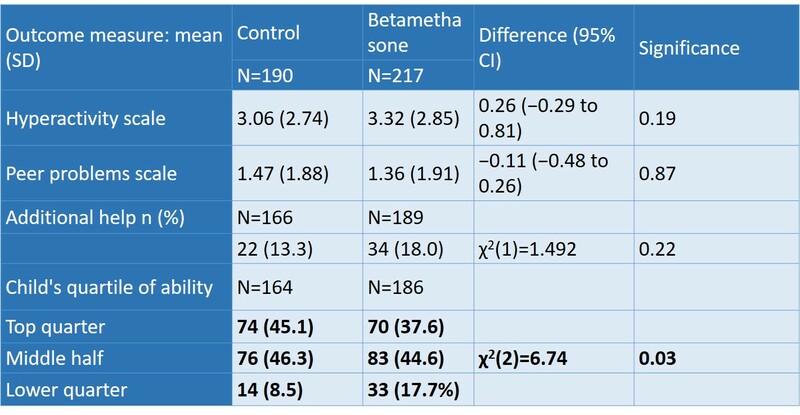 The SR does, thankfully, go on to also provide the results of the 2 groups of trials separately, here is an edited version of table 3, which is the results of neonatal outcomes for the studies of mothers at high risk of delivery between 34 weeks and 36 6/7. The first fractions are the results from the steroid group, the second are the controls. As you can see it really is only the multi-center MFM network trial which contributes much to the results. Don’t ask me what the column headed τ2 is, it isn’t explained in the methods. Although 40 % less severe RDS and 40% less need for surfactant sounds great, another failing of this SR is the complete lack of any calculation of absolute risk reduction or NNTs, so I have done it for you. The absolute risk reduction is from 2.4% to 1% in the Gyamfi-Bannerman trial, an ARR of .014, or a number needed to treat to prevent 1 case of severe RDS of 71 (I can’t calculate the 95% CI without putting all the numbers into another computer program), which is a lot of injections for no decrease in need for intubation, but avoiding surfactant in one baby. The downside, as you can see from that table, is a substantial increase in the incidence of neonatal hypoglycemia, from 15% to 24%. an absolute risk increase of 0.09, with a number needed to harm of 11. Hypoglycemia is defined in the supplementary material of Gyamfi-Bannerman as a glucose at any time of less than 40 mg/dl, which is 2.2 mmol/L for those of us who use modern units. The protocol doesn’t state anything about standardized monitoring for blood sugars in the babies of the participants that I can see (the protocol is available on the NEJM website, and I read it, just to be able to write this blog post for you my gentle readers), as it was a masked study we must assume that the babies were monitored in the same way in the 2 groups, so the increase is probably a real effect of the intervention. As you can see from the first table, mothers with diabetes were excluded from this trial. One conclusion of this analysis is therefore that there is a substantial increase in the risk of hypoglycemia, and therefore all babies born after antenatal steroids will need to be monitored for this effect, in the same way as babies with other risk factors, which is a lot of extra blood sugar monitoring and extra pain, for 100% of the babies, for a non-significant decrease in the number of babies needing mechanical ventilation of 0.6%! I am actually quite surprised at the BMJ, who have one of the highest standards of editorial review, in my opinion, that this SR was published like this. If we go on to the issue of steroids before elective caesarean delivery, it gets even murkier. There is no “neonatal hypoglycemia” in this table, because it wasn’t reported in any of the trials. I think we have to assume therefore that there might well be a increase in the incidence of hypoglycemia for this group of babies also, and treat antenatal steroids as a risk factor for hypoglycemia in all of the babies. The supposed benefits of antenatal steroids are, for example a fantastic 78% reduction in severe RDS. Wow! But the reduction in severe RDS is, in absolute terms, from about 1% to about 0.25% so a number needed to treat, NNT, of over 100. The 2% reduction in NICU admission (from 5% to 3%) gives an NNT for admission to the NICU of about 50. Some of the outcome variables are pretty dumb, 2 hours less on oxygen for example, only applies to the babies who needed oxygen to start with, and is of no real clinical importance. The predicted probability of admission at 37 weeks was 11.4% in the control group and 5.2% in the treatment group, at 38 weeks it was 6.2% and 2.8%, respectively, and at 39 weeks it was 1.5% and 0.6%. Which means that at 39 weeks the NNT is about 111 to avoid admission to the NICU for respiratory distress, but overall admissions are not actually significantly reduced. I do think that avoiding NICU admission is a worthwhile goal, and reducing neonatal respiratory distress is also worthwhile. But with such a small absolute reduction in these outcomes we had better be sure that the intervention is safe. Only one of these trials has tried to do long term follow up of the babies. Stutchfield sent out a questionnaire to parents of babies born in 4 of the original centers in the trial (n=about 800), only about half were returned, and about 7/8 of those also had a school questionnaire returned. 25 (12%) children whose mothers received betamethasone had reported learning difficulties compared with 27 (14%) control children. The proportion of children who achieved standard assessment tests KS2 exams level 4 or above for mathematics, English or science was similar. With the large number of comparisons made this might be a spurious finding, but it certainly should give some pause before recommending antenatal steroids for this indication, a recommendation which might apply to many thousands of mothers and babies every year. So what are current recommendations? Antenatal corticosteroids should be given to all women for whom an elective caesarean section is planned prior to 38 +6 weeks of gestation. I think these two guidelines are both mistaken, neither of them has bothered to look at the absolute risk reduction (or increase), the number needed to treat, or the potential harms. I think the recommendations should be much more nuanced, and note the very large number of treated women for whom there will be no benefit, that the decision should/must be discussed with the mother (who knows maybe even the father). I think the biggest potential adverse effect of these guidelines is that the risks to the baby of a late preterm delivery will be minimized; that obstetricians, who already think that late preterm birth is unimportant in the long term, will think that they can blithely deliver babies before term as long as they give steroids. We need to emphasize that late preterm delivery is a major risk factor, on a population basis, for adverse developmental and health issues in children. A great review article from Betty Vohr in 2013 laid out all of the then available data showing adverse impacts of being born before 37 weeks, we now, of course, have even more data, and more reasons for concern about these infants. Another review from last year, with Elaine Boyle as first author also noted the adverse long term physical health effects of being late preterm or early term, compared to really really full term. The impacts of late preterm, or even early term delivery should not be minimized just because we might be able to slightly reduce the risk of some short term respiratory adverse effects with antenatal steroids. Only when preterm delivery is inevitable or essential for the mother or baby should we start to weight the risk/benefit balance of antenatal steroids, which doesn’t seem to me to be a closed question: with total NICU admissions and need for mechanical ventilation unchanged, and substantially more hypoglycemia. This entry was posted in Neonatal Research and tagged long term outcomes, Randomized Controlled Trials, steroids, Systematic Reviews. Bookmark the permalink. 7 Responses to Antenatal Steroids closer to term? Thanks. Really interesting. Hope ACOG and RCOG, as well as other scientific societies take note. Can you break down the data in the table showing hyperactivity, peer problems, etc., for laypeople who aren’t trained to read studies? Which of these is the most accurate? The most worrisome? And what about other studies related to steroid use which you don’t address here, like the ones showing measurable differences in brain structure, or stress response at school age? Or risk of depression? How siginificang are these studies? How worried should parents be whose children received steroids, either before or after the 34 week mark? Would be grateful for any more thoughts you might have on steroids. The long term outcome data are really limited, only applying to one study, and less than half of the parents responded to the questionnaire. The data basically show no difference in hyperactivity and peer problems, babies whose mothers received steroids had almost exactly the same chance of those problems as those who did not get steroids. For the educational outcomes they are presented in an extremely limited way, and the sentence in the abstract states that the proportion of children achieving a certain level of competence on the standardized tests was similar between groups but they never actually tell you that in the publication, but present a different and more worrying result instead showing a shift downwards in the steroid-exposed children’s academic ability compared to controls. Thanks for your reply. I have two children who were treated with steroids antenatally, one delivered at 33 weeks (by c/s due to slow abruption), and one at 36w4d (I developed obstetric cholestasis, but delivery was planned for 37 weeks because it was my 4th section and I had a history of complications). I don’t have an issue with the 33 weeker receiving the steroids, but with the 36 weeker, I was not counseled at all about the relatively low respiratory complication risk, the risk of neonatal hypoglycemia (which did happen to us, his sugars dropped to 25), and unknown longterm risk to his other organ systems. I am quite confident that had I had any idea of the risk/benefit ratio I would’ve declined the steroid shots, but my MFM (teaching faculty at a large US East Coast hospital) did not present it as a choice. I am devastated and worried about long term problems for both my children who were exposed to these drugs, but particularly my 36 weeker (now 13 months old), since it seems a particularly vulnerable period to be exposed to these drugs. Thank you really interesting. Thank you for the valuable information.